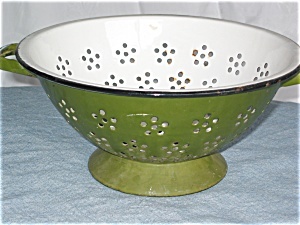 Vintage green graniteware collander. c.1970. Signed and shown in the book. It measures 10.25 across x 5 high. The interior is in good condition, and the exterior is also in good condition but for a tad of rust on the bottom. Shown in the yellow color in 1993 book 2 by H. Greguire. Marked 'Japan' and some symbols on bottom. The book says it dates to 1970, that's why it has that lovely early 70's green color! Scroll thru the pictures for some ideas to display your graniteware treasures!